This 223 Rem cartridge by PMC features a 55 grain bullet. The bullet sports a full metal jacket, so your rifle’s bore will be preserved against lead fouling which would loosen your groupings. It also features a boat tail design, which stabilizes its trajectory in flight for increased accuracy, a higher ballistic coefficient, and resistance against cross winds. PMC ammunition is manufactured in South Korea by the Poongsan Corporation, which makes everything from small arms cartridges to howitzer shells for their country’s military. The company’s mission is to make South Korea totally self-reliant for all of their ammunition needs, and as such they spare no attention to detail when it comes to their products’ quality. Great price and service and shipping. Top product, top price, love the service! Good product at a very good price. 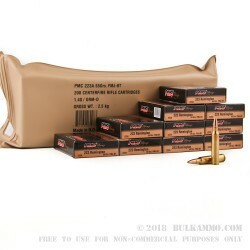 Q: Why is this ammo so cheap compared to the other ammo listed. 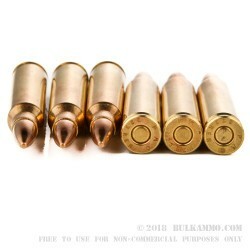 What are the major differences in the ammo that warrant such a huge price differencial? 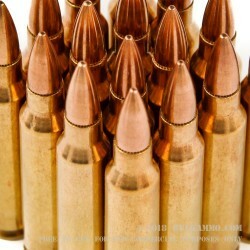 .223 ammo as high as 26 dollars for 20 rounds compared t Po this. A: Hello Jason, These 55gr. FMJ rounds by PMC in .223 are excellent rounds. They have brass cases, lead cores, and copper jackets. We try and price our ammo as low as possible to get you the best deal on them, so when we get a good deal on them from the manufacturer, we pass it along to you.